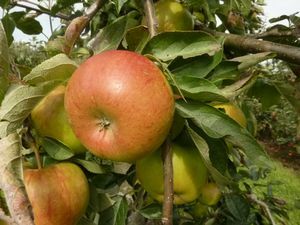 Chivers Delight - Dessert Apple Tree £12.75 - Dessert Apples - Late Season Apple Trees and Fruit Trees For Sale. Buy at competitive prices with wholesale discounts. A golden apple with a sweet sharp juicy flesh. This variety originated in Cambridgeshire 1966. Ripening in November will keep until March. It’s reliable heavy crops are resistant to blemish from apple scab.